A few things we have done to keep the ‘gimme’ attitude at bay and the gratitude in the forefront is do lists a little differently. The last one give – this one is the magic one. This is the one that changes our perspective. This is the secret sauce to getting rid of the "I deserve this," attitude. I ask my kids who they would like to GIVE to this year. It's different than giving a gift to a family member or friend. This is something we carefully research. We ask the kids what stirs their heart or what they are passionate about giving too. Maybe they don't know yet, and this is a perfect time to find out. 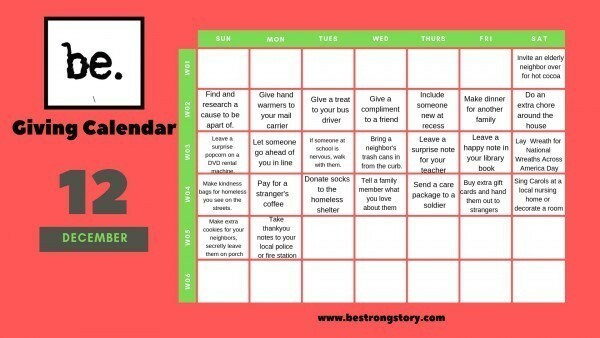 We have started a December GIVING calendar, to intentionally set their hearts and minds on giving. We made this together, and Carter Mae my 7-year-old said yesterday, "mom, you have to print out the calendar!" Do we do what is listed on the calendar every day? HECK NO, but we get as many as we can in. We try (key word: try) to make sure our entire family is living December especially on behalf of others instead of ourselves. The Christmas presents are awesome, but mean so much more when we have gratitude for what we get. A little perspective change when we see others needs goes a long way. Try it with us this year. Add your own and get the kids involved – they have the best ideas! 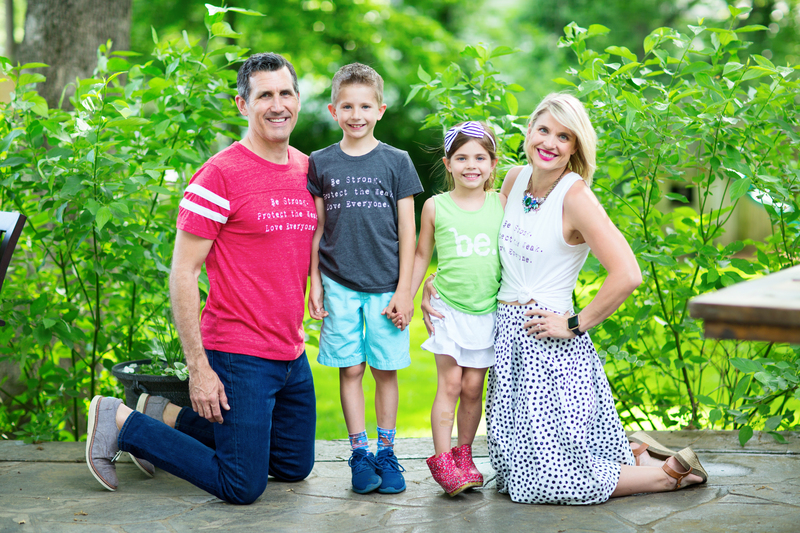 Wife to Grant, Mama to Carter Mae and Holden, Founder and CEO of BE STRONG STORY, a lunchbox note turned into family mission and now business, spreading the BE STRONG, PROTECT THE WEAK, LOVE EVERYONE message to one family at a time.